Once upon a time, a new manga fan found a monthly print magazine called Shojo Beat. They bought several issues, and loved the idea of an anthology bringing a variety of manga stories. But as time went on, they fell away from Shojo Beat, and then the magazine itself fell away, too (though it still survives as an imprint). That fan never forgot about Shojo Beat, and its concept. I tell that story, because I have a funny feeling that the publishing team of Sparkler Monthly, a digital magazine dedicated to bringing female-friendly OEL Manga, light novels, and even audio works to their subscribers every month were also fans of Shojo Beat. While the content and theme is different, there's definitely some similarities--and that's a good thing. After finishing their first year and seeing what works and what doesn't, along with the challenges of dealing with a putting out work on a monthly basis, it was time for Sparkler to make a stand: If people want this content to continue, they need to subscribe. Through the month of August, Sparkler has been doing various outreach campaigns to hit a goal of 200 subscribers. If they don't get it, the chances of having a third year of stories is very small. The primary audience for Sparkler Monthly is girls and women aged 15 and up, or anyone interested in the rough ballpark of Female Gaze. Our four founders and most of our staff identify as female and are committed to promoting inclusive, fem-positive, and ridiculously fun content. We welcome creators of any gender and are particularly interested in entertaining, engrossing stories that tap into the variety and diversity of fandom. Unless stated otherwise, the stories and Sparkler Monthly website are appropriate for ages 13+. 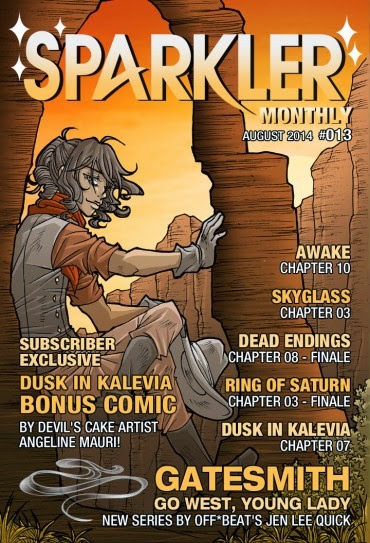 I took the opportunity of this subscription drive to reach out to the folks at Sparkler, because I'd been wanting to do a feature on them anyway. As we approach the end of the month, they are over the 100 subscriber barrier. If you've been debating getting on board, perhaps this site overview will convince you. Please note this is an overview, not an in-depth review of any particular story. What I set out to do was see "What makes Sparkler worth supporting?" rather than "Hey, this one storyline is really cool!" After all, when you are paying for a monthly anthology, you need more than one or two things to be good. It needs to be a complete package. Based on my research and dabbling, I'm happy to say that Sparkler does a great job of being a provider of OEL content, not just in the realm of manga, but in other areas of Japanese comic culture that are not always well-explored. While this might not be the magazine for you if your only interest is light novels or comics, anyone who appreciates how these various types of media work in tandem in Japan will be pleased with Sparker's format. Those looking to expand beyond just comics in terms of OEL culture might look to Sparkler as a place to start. When you first encounter the website, it has a nice, clean look and feel. There are menus that will take you to the various content types (comics, audio, prose, and bonus material) if you want to quickly move to a certain type of media. Now, you do need to be a subscriber to just click-and-read, but if you are a monthly subscriber, pretty much everything you want is available to you immediately. You pay extra if you want to download back issues (though the current issue is free to download), and some of the bonus material costs more as well. However, what's available at the $5 monthly level is more than enough to keep you busy! Ms. Quick's linework definitely captures the OEL style, and I like that while she utilizes elements of manga, they only appear when needed, not all over the page to show how Japan-like the comic is. (That has been a problem for me when reading OEL work in the past.) I only read a bit of the story, but the panel layouts are strong, and I really dig the shading work. 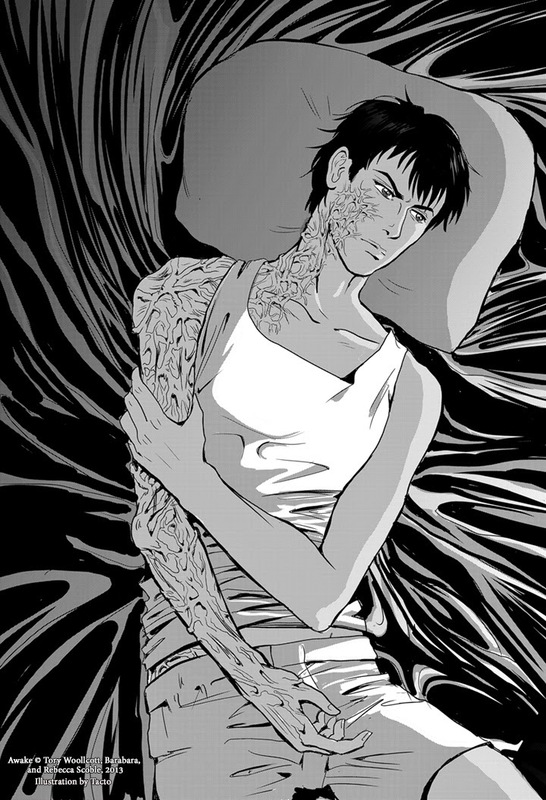 The damaged Travis from Awake. 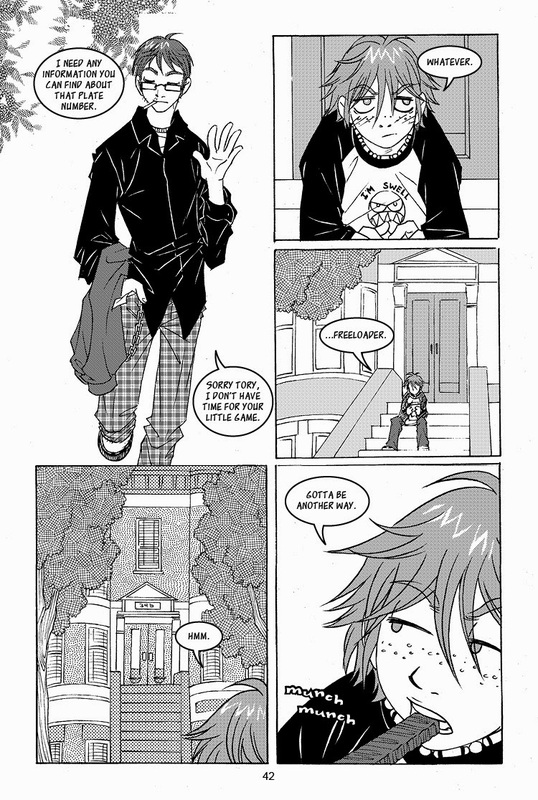 That same style of working within manga techniques holds true across the (sadly on hiatus) Dire Hearts from Christy Lijewski and the newest comic, Gatesmith, which is also created by Quick. Though only one chapter so far, it's a very stark Western that opens with death and ends on a note that's uber-creepy! The audio side of things is really interesting, and one I intend to return to to catch up on once some of my SPX work is finished. I was shocked to find that this was not an audio-book style work, but an actual radio play, just like in the days before television! While there are a few glitches here and there--it's clear that the production is high-quality amateur, not professional, like, say, a Big Finish production--the enthusiasm shines through and as the chapters go on and the readers become more comfortable with their characters, it is very entertaining. Several hundred years in the future, the United States is overcrowded, low on resources, and dealing with a bitter homeland war. In the midst of this, colonizing ships send tens of thousands of people to start a new life on earth-like planets in different solar systems; all passengers are cryogenically frozen for the duration of the 1,000-year voyage. The ships aren’t fully automated, however--they need human crews to keep the machinery running and to act as a failsafe to wake the real crew if something goes wrong. For people who can’t afford the high cost of buying fare on the ship, they can pay their way as part of the crew: ten years on the crew equals passage for one person. These individuals are taken out of cryogenic sleep once, left awake to work their years, and then are frozen again. People are woken in staggered shifts--a full crew is six “awake” people at one time. 600 years into the voyage, Hina Hwan is woken to work her half of the thirty years needed to pay the fare of her fiancee and his young daughter. But she swiftly learns that the only thing worse than six people isolated in space...is six people and an unidentified corpse. The cast is engaging and the focal character, who loves her fiance so much she's willing to sacrifice years of her life for him, really comes in an upsets the apple cart of how the ship functions. I haven't finished listening yet, so don't tell me what happens next! It's obviously hard to judge the quality of the prose selections just by reading them here and there, but those worried they might be boring--don't be. Whether it's the ghost-themed "Dead Endings" or the story of a young woman's desire to find herself within a city that's hiding secret after secret in "Gauntlet," the prose I read had clearly been edited and selected. It's not going to be for everyone, but the parts that I sampled were engaging enough, and your interest in the plot, like any story, will determine how much of these you decide to read. The final section, bonus material, ranges from things you need to pay for (like more mature content), tips on being a creator yourself, and of course, artistic pinups of both women and men (a nice change from what we get in mainstream work!). Overall, there's a ton of stuff, and with each issue featuring roughly half a dozen stories/articles/etc., there is a lot of value for fans of OEL manga and light novel for just $5 a month. If you need a comparison, it's about $5 per digital tankouban at, say, Viz. I think the total content you get here is definitely of the same value--it's just that the name recognition is lower. Given Panel Patter is pretty much the place where we champion folks who don't always have name recognition, that shouldn't matter. 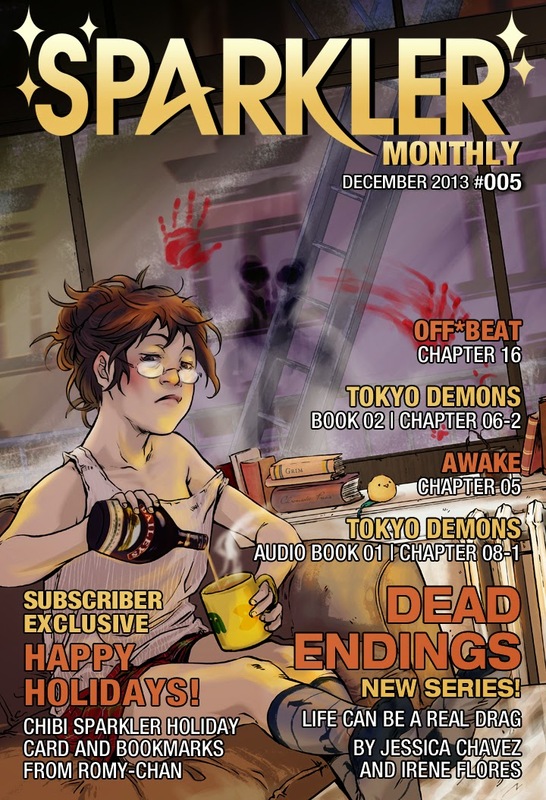 Sparkler Monthly has just a few days to go in their Subscription Drive. What it comes down to is that depending on how many people sign up, this magazine either continues, expands, or folds. I understand that money is tight. I have to make careful choices--all of us at Panel Patter do. But what I know is that I hear a lot of people saying, "I wish there was more content that was designed for women." Well, here's the thing--it exists! It's just not going to be found in those decades-old universes or even in the new ones created by those same writers and artists, both in comics and in more text-based forms. Instead of paying 4 bucks to complain about the portrayal of Character of the Month, why not add a dollar to the pile and try Sparkler instead? You might find that not only your blood pressure will go down, but you'll also have a new, quality comic/prose combo to enjoy. And the more of us who do that, the more of this we'll get. It may be art, but it's also economics. If we fail to support attempts like Sparkler, then we have no one to blame but ourselves when the content we say we want doesn't exist. Not convinced? Here's a link to the sampler put out by Sparkler. When you like what you see, or if you're ready, here's how to join the funding drive. And the general Sparkler website is here.